Award-winning fine and bridal jewellery manufacturer Hockley Mint will have unveiled an updated brand identity. By Rory Howard A rising star has settled into jewellery lovers’ views as the London-based. The casting, 3D printing and bespoke manufacturing company Weston Beamor has recently confirmed its involvement. This year Deakin & Francis are proud to be celebrating a gem of an anniversary. Innovative, Birmingham-based packaging company Talbots Group is thrilled to announce that it has been shortlisted. UK jewellery manufacturer Hockley Mint has launched the Fairtrade Ambassador Scheme – a new initiative. AnchorCert Analytical testing laboratory are globally recognised for their expertise in the field of precious. 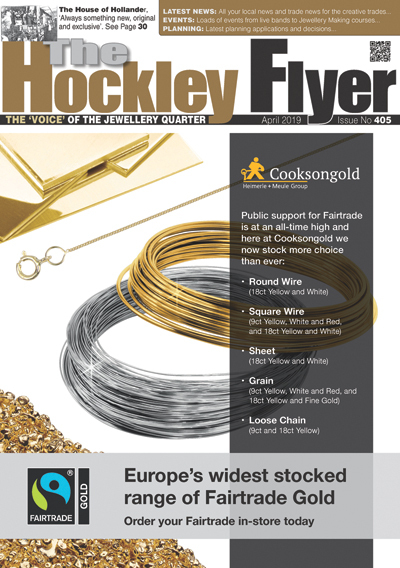 Hockley Mint, has reported growing interest from jewellery companies and designers in northern Europe following. City of Hull Trading Standards has won the British Hallmarking Council’s Touchstone Award 2016, with. Precious metals specialist the Stephen Betts Group is fashioning new markets with the acquisition of. Hockley Mint has received an ‘outstanding’ grade by the Knowledge Transfer Partnership (KTP) Grading Panel. Everyone loves the iconic Harrods green doorman. So this year Deakin & Francis have partnered. What happens when a family heirloom or unique piece of jewellery is stolen or lost?. ‘Trading since 1947 supplying tools, equipment, clocks and materials worldwide, H S Walsh are absolutely. Talbots Group will launch a new website in April, offering a fresh format that will. Sarah Carpin, director of specialist jewellery and media agency Facets PR, will host the opening. Jo Pond – Programme Leader – School of Jewellery ‘Jo Pond’s most recent jewellery works. The eagerly anticipated Fundamentals collection is the latest cufflink range to be launched by British. Hockley Mint has reported overwhelming success following the launch of its new trade website, with. This year’s Baselworld is an exciting one for British cufflink manufacturers, Deakin & Francis. As. The British Hallmarking Council (BHC) is calling for entries to its 2016 Touchstone Award, underlining. In the year of 2016 Deakin & Francis are proud to be celebrating a ‘gem’. The Birmingham casting house, 3D printing and bespoke manufacturing company Weston Beamor will, quite literally,. December 3rd saw the 80th British Jewellery Giftware & Finishing Federation’s Benevolent Society Ball take. Fully-traceable jewellery brand Arctic Circle Diamonds has partnered with Wedding Magazine’s annual Wedding of the. Birmingham Museum and Art Gallery (BMAG) and the Jewellery Industry Innovation Centre, (JIIC) School of. This year’s Ball will be taking place on Thursday 3rd December at St John’s Hotel,. Catch the first winter spirit with the new graceful Fei Liu collection created exclusively for. Isabella Liu, London based Chinese jewellery designer and artist, has won two gold awards at. Tickets are selling fast for this year’s benevolent society ball (previously the jewellery & giftware.